It is sad that Xenoblade Chronicles has become such a troublesome game to get ahold of. From the difficulty in just getting it released to the rumors of Gamestop price-gouging used copies, the game will likely be remembered more for this than the actual game itself. And that’s a shame, because as my 75 hours logged have shown, the game is damn fine. And I only just now got my final party member. The box is reversible too! I got so happy when I saw that. 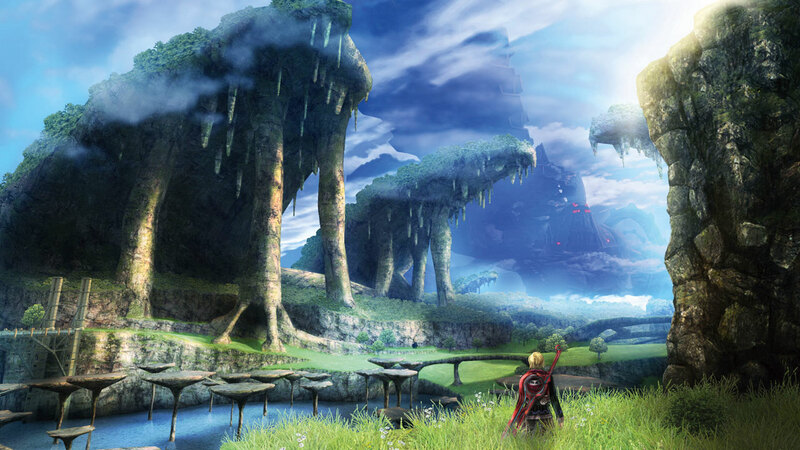 Xenoblade Chronicles is a story of revenge, or at least, it is at the point I’m at. 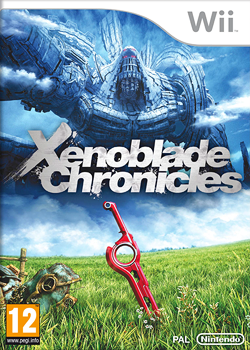 Main hero Shulk gets thrown into a quest for revenge when a friend of his is violently slain by Mechon, a race of machines that seems hell-bent on destroying Homs, or humans. By being given the magical sword, the Monado, Shulk and his unlikely team of heroes go on a quest to kill the Mechon that killed his friend. It sounds like a simple set-up, and one familiar to JRPG players. It is at a glance, but like so much about this game, the devil is in the details. Firstly, the world is wonderfully creative. You explore the body of what is essentially a God, the Bionis. The Bionis had locked in a war with another being, the Mechonis, for countless years, until one day, they stopped. Life flourished on these beings’ bodies, and you crawl around on their body like ants. This is used for primarily as an interesting idea, but every so often you’ll stumble upon some breathtaking landscape that reminds you how unique this is. You’ll see a mountain range that looks like a hand. You can see the other god in the distance. Very clever, and very well done. Don’t you wanna explore that? But Derek, you ask, did you really put in 75 hours? The game has large, very large areas, just begging to be explored. Monsters roam these landscapes, items dot the plains, and each new path leads to something worth finding. Everything you do, from finding landmarks (warp points) to collecting items rewards you in someway, whether it be new gear or experience points. And these areas are huge! It can take ten minutes to run across some of these maps, and that’s a straight shot with no distractions. Fortunately, there are plenty of distractions along the way. Not only that, but this game has a multitude of side-quests. As you explore the few towns in the game, you will meet people who give you quests to perform. The quests themselves aren’t super interesting, usually kill “X” monsters or collect “X” items. But more often than not, I found myself completing these quests just as I explored the world. Killing X monsters is easy when you find a group of them as you were seeing where a path led. And collecting X items often happens before I even take the quest on. It’s a pretty addictive system, especially since the rewards can be great (items to sell therefore more money, and plenty of experience points). Plus, they keep a handy checklist of all the quests you have. As someone who hates to see a checklist unchecked, I find myself constantly ticking things off. Each town is also full of people. People fall into two categories, those that tell you their name and those that don’t. The ones that do tell you their name are added to a giant flowchart, showing their relationships with other characters. While it’s not super compelling, it’s kind of fun to see people change their attitudes about others when you talk to them a second time, or after completing a quest to help a friend. It’s an interesting system, and surprisingly addicting. I’ve found myself seeking people out, to see if their relationship can change and if I can make them happier. I still haven’t talked about the battle system, or the actual gameplay yet. 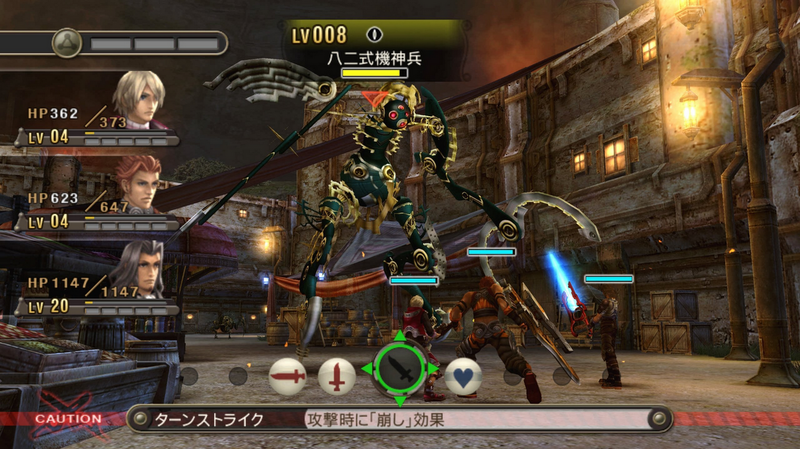 The battle system is real-time, with auto-attack enabled for all the characters. Essentially, if your character is in range of a monster target, they will automatically attack it. You can assign up to 8 skills to a skill map that lays on the bottom of the screen, with each character having a unique skill in the center. Shulk can use the Monado’s abilities, for example, whereas Riki can steal items, or Reyn can draw the enemies’ attention. Characters themselves fall into familiar classes, such as healer, attacker, magic-user, tank, etc. You can choose the one best for the situation. And they get experience points even if they don’t participate in battle. Anyone who has played a JRPG can appreciate that. There are no healing items, or expendables in battle. Nor are there things like magic points. When you use a skill in battle, you need to wait for it to recharge before using it again. It’s simple, but effective, especially since battles can get really chaotic really quickly. Now, I think I’ve talked about the game enough for one day. It doesn’t look like I’m anywhere near done with the game, and will likely be playing it for quite a long time yet. I gotta keep something to talk about in another blog post. Plus, once Mario Kart 8 comes out, Xenoblade may just have to wait.